Jiebo Luo and Yu Wang did not set out to predict who would win the 2016 U.S. presidential election. However, their exhaustive, 14-month study of each candidate’s Twitter followers–enabled by machine learning and other data science tools–offers tantalizing clues as to why the race turned out the way it did. “We wanted to understand how each of the candidate’s campaigns evolved, and be able to explain why someone won or lost,” says Luo, an associate professor of computer science. “In the end, even though we chose not to make any predictions, we were not surprised at all that Donald Trump won,” says Luo. Barack Obama’s use of social media in the 2008 presidential race helped establish Twitter and other social media platforms as powerful tools for candidates to quickly reach and receive feedback from large numbers of potential voters–and to attack their opponents. Since then, there’s been a burgeoning interest in scholarly research employing data science to analyze elections based on social media postings. Twitter, in particular, is a rich source of data because the millions of tweets posted by its members each day are easily accessible using an application programming interface. The key for Luo, Wang, and their colleagues was to collect as much of this data as possible, starting early in the campaign, and to then “mine” it in innovative ways. 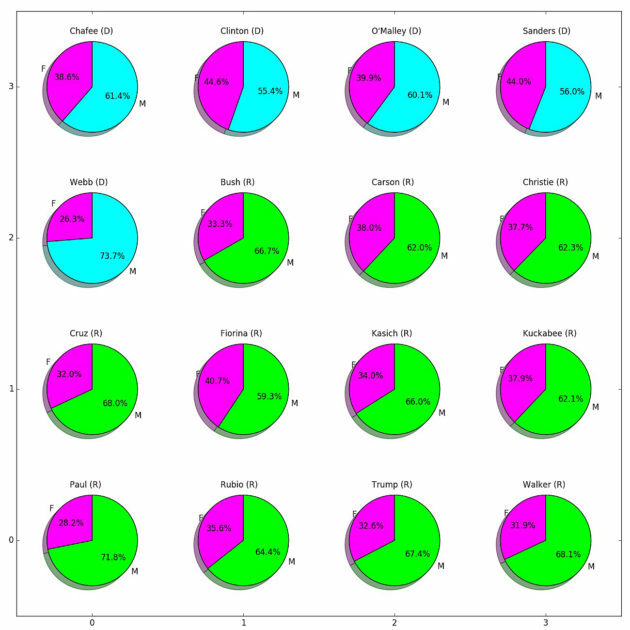 Gender of candidate Twitter followers in April 2016, compiled by Wang and Luo. “The very nature of this data is that it will disappear tomorrow, so we had to start capturing it from an early stage and design a research framework so we could continue to collect data all along,” said Wang. The number of Twitter followers of each of the major candidates in the initially crowded field–updated every 10 minutes. 8 million tweets sampled from the followers of Clinton and Trump. 1 million images of the candidates’ followers on Twitter. 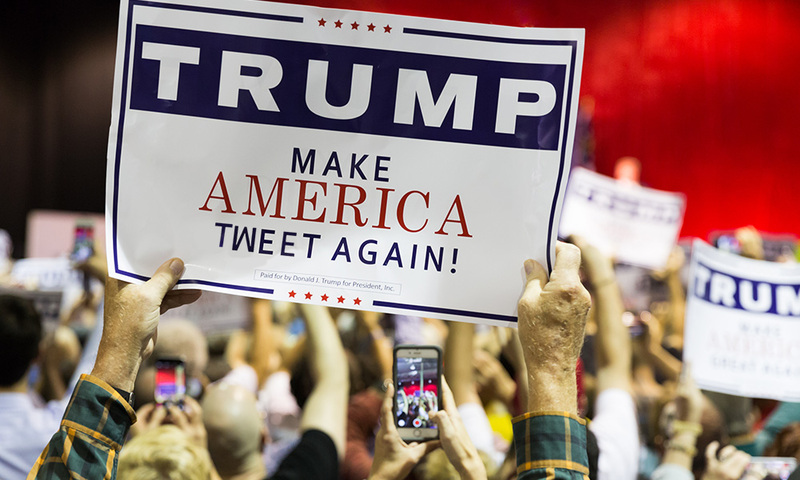 5 million Twitter IDs that include all candidate followers in early April 2016. Using advanced computer vision tools, the researchers trained an artificial neural network (what’s called a convolutional neural network) to determine–with 90 percent accuracy or more–the age, gender, and race of the candidates’ followers using their Twitter photos. This helped the researchers analyze the role of each of those factors in the campaign, as they tracked the changes in each candidate’s followers before and after debates, for example, and how followers reacted to the candidates’ own tweets. 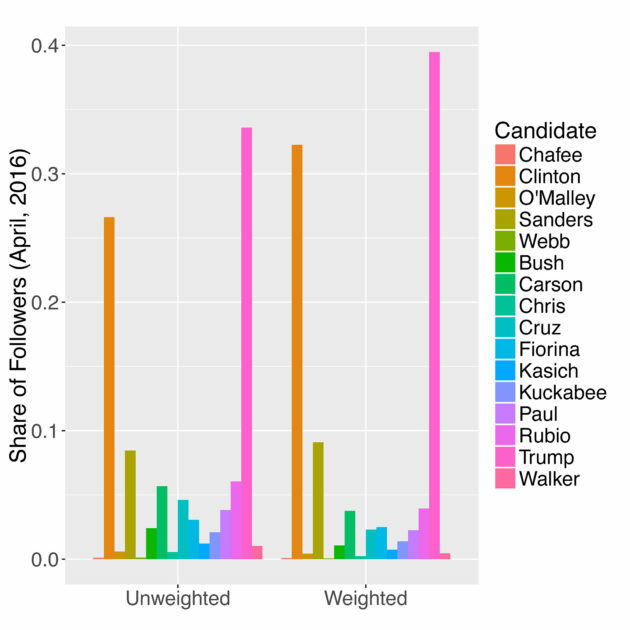 The candidates’ shares of total Twitter candidate followers in April 2016. The unweighted tallies simply count the number of followers. The weighted tallies take into account the fact that one individual can follow more than one candidate. As an example, an individual following two candidates has only a weight of 1/2, and an individual following three candidates has a weight of 1/3. By avoiding double counting, the weighted metric could better measure candidates’ influence. Election Bias: Comparing Polls and Twitter.